Instead of lassoing the turning stitch, the yarn over method creates an extra stitch that closes the gap formed by short row turns. So instead of doing a wrap and turn, simply turn the work. To create the yarn over, bring the yarn from front (where it would be ready for purling) to the back between the needles, and bring it over (see, yarn over! there is method to the madness) the needle to purl the next stitch. You’ve then created a yarn over which sits at the outside of your row, paired with a regular stitch. In the photo below, reading the knitting from the right to the left on the left needle, the first stitch is the regular stitch, the stitch to the left of it is the yarn over. There are 4 yarn over pairs – can you see them all? 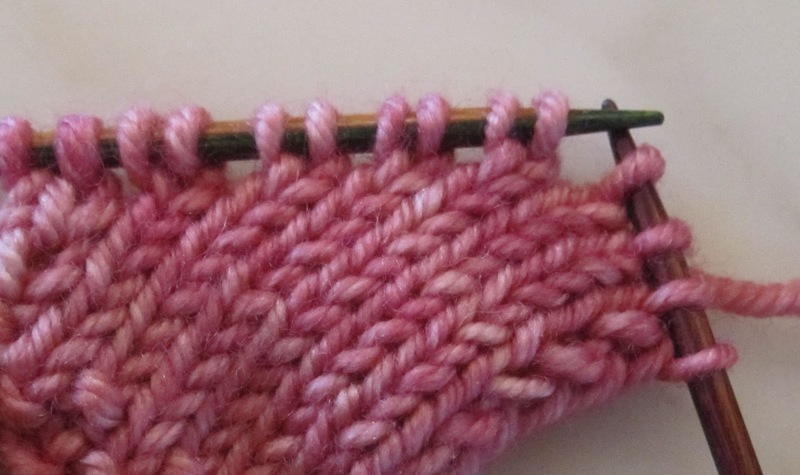 The regular stitch comes out of a v shaped stitch below it – the yarn over doesn’t. 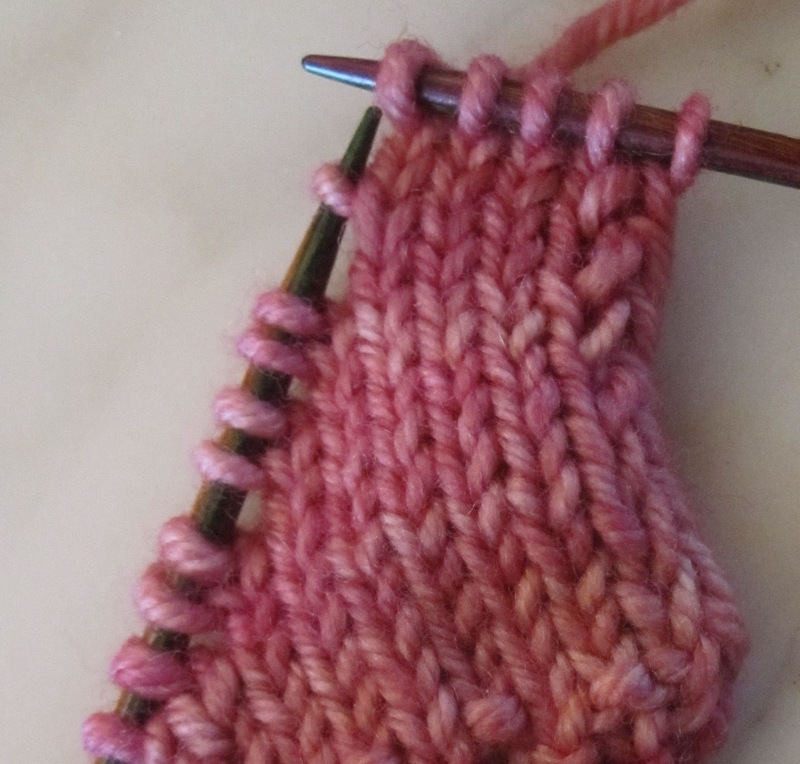 There are also noticeable gaps between each yarn over pair. To create a yarn over at the start of a knit row, bring the yarn from the back (where it would be ready for knitting) to the front, and then over the needle to the back to knit the first stitch. Now you’ve got a yarn over stitch sitting at the outside (right side when looking at it from the right side of your work) of your knit row. You’ll see from the photo I’ve only done the yarn overs at one side, created when working the purl rows only. 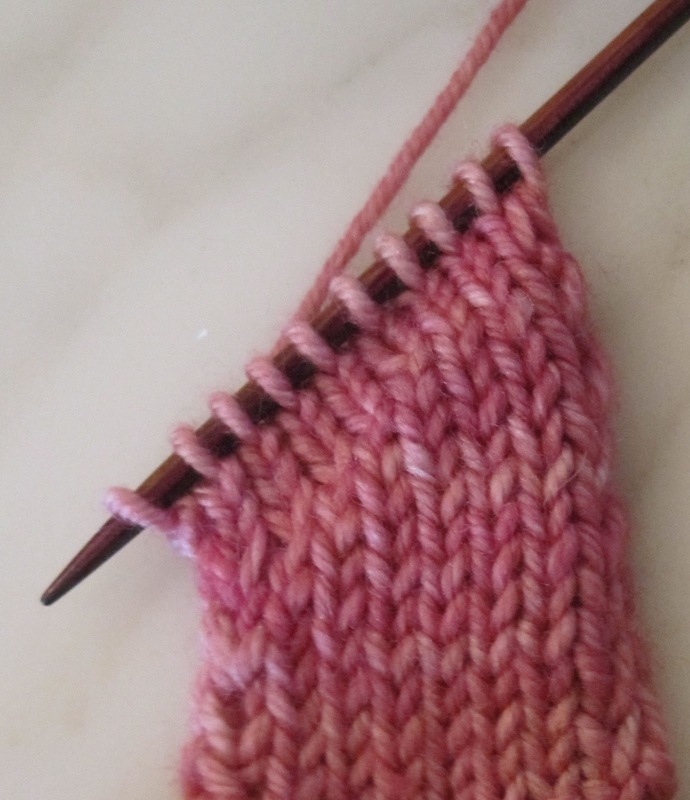 To work them, on the knit side of the fabric, you would knit to the first regular stitch of the first yarn over pair. Knit that regular stitch and then work the yarn over together with the next regular stitch by knitting the two together. Remember the gaps I mentioned above? The yarn over is on one side of the gap, and the regular stitch on the other (see photo below, where I’ve already knit the regular stitch of the first yarn over pair). Working them together closes that gap. This is a nice easy method but alas, it also has a finicky side to it. 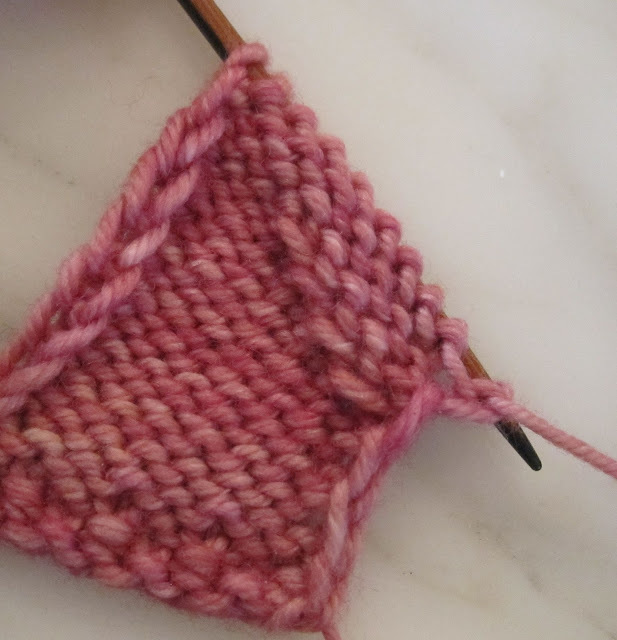 On a purl side, you would need to purl the first regular stitch, then do some knitting acrobatics to make this side mirror the k2tog on the knit side – an SSP. That is, slip the yarn over knitwise and the next regular stitch knitwise, then purl both of them together through the back loop. Since all my yarn overs on the sample are worked on the knit side, I’ve managed to sneakily avoid doing SSPs. Not a bad method – and in a pinch for regular stockinette fabric I’d opt for this over the wraps as there isn’t all that lifting and stretching.